I stopped off in Mt. Vernon, Texas on my way home last week, in order to get a photograph of a New Deal building for the Living New Deal project. Although I have driven past here on the Interstate many times in the past 11 years, I had never taken the short detour over to the town. It did not take long to locate the building I needed, but since I was there anyway, I deemed it worthy of a short pit stop to see what else it might have to offer. Plenty! 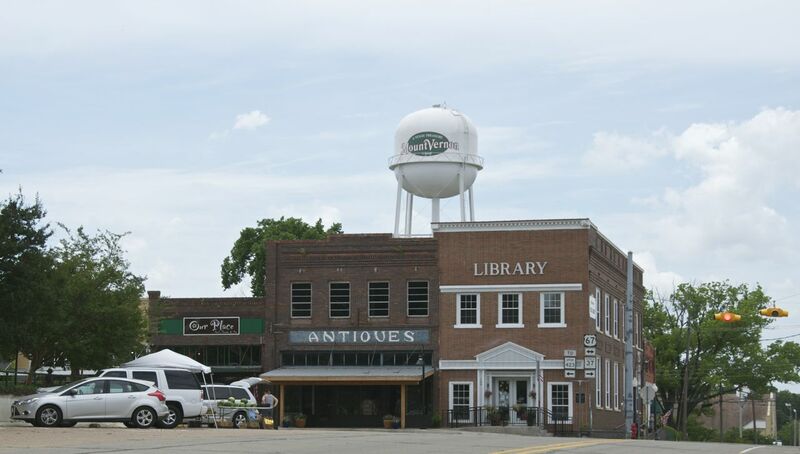 (Besides the watermelons and other fresh produce available on the “historical town plaza.”) The library is currently housed in the 1912 former First National Bank building. Unfortunately, the front of the building has been altered significantly, with the original pediment and columns having been removed. You can see the original building–way more imposing!–at the Franklin County Historical Association. One of the early residents was M. L. Edwards, who started his business in 1900. The building dates to 1915 per the Franklin County Historical Association. Mr. Edwards’ grandson currently operates the gift shop/antique shop/cafe in the building (Hospitality by the glassful: East Texas vineyards, IN Magazine.) Mr. Edwards also co-founded the funeral home with Cecil Harvey in 1900 (Sam B. Harvey Funeral Home). I originally thought the plaza, or town square, had housed the courthouse, but early photographs show the 1912 courthouse (coming in a later post) to be opposite the plaza. Apparently, 1912 was a big year for buildings in Mt. Vernon. Franklin County Historical Association has early photographs of many of the buildings, including the courthouse and library. The depot was constructed in 1894, although it has been relocated from the original position facing the railroad tracks. The Bankhead Highway, which was the first east-west transcontinental automobile route from Washington, DC to San Diego, was completed in 1919 and is Mt. Vernon’s Main Street. 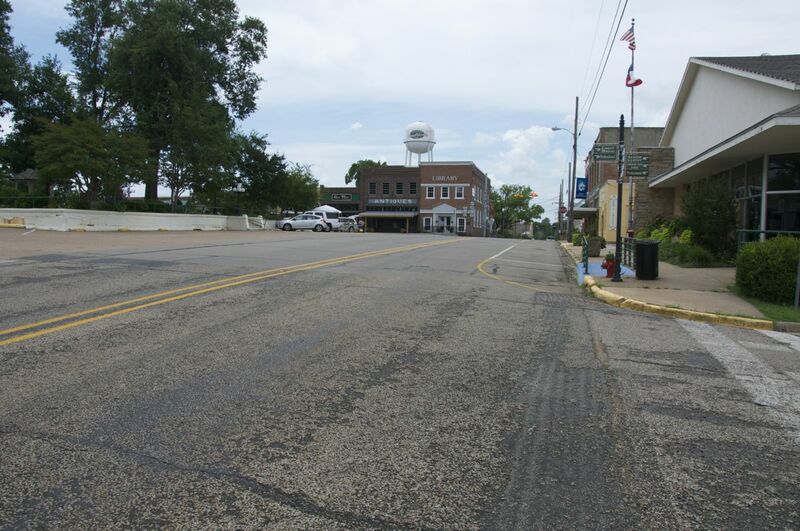 The highway follows the old Choctaw trail through Franklin County. The Cherokee Trace is on the edge of Franklin County. This entry was posted in Texas, train station depot buildings and tagged Franklin County Historical Association, Mt. Vernon. Bookmark the permalink. Love this post, Suz. Such depth behind the apparently mundane. Thanks, Jean. 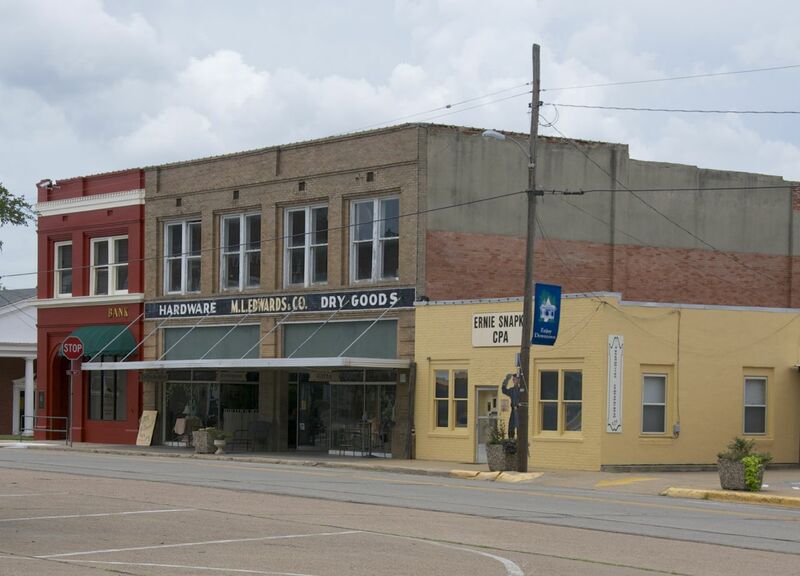 I love visiting small rural towns, and thanks to the Internet, it is now fairly easy to learn about the history–not as much fun as it used to be to sit in the stacks in the library, but definitely easier and faster.